You’ll also find blind spot monitoring with rear cross-traffic alerts. As you’re driving down the road, you’ll be alerted if there is a vehicle on either side of you so that you know not to change lanes. When you’re backing up, the rear alerts will tell you if there is a vehicle approaching from either side. 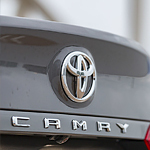 This technology is new to the Camry and can prevent collisions.